As everyone tries to find ways of creating additional income, one option has been gaining popularity. This is Forex trading and both experts and the not so proficient are attempting to learn as much as they can so that they will be better able to trade and be successful at it. The way to do this is to have more than a basic understanding of some of the main aspects of Forex trading. 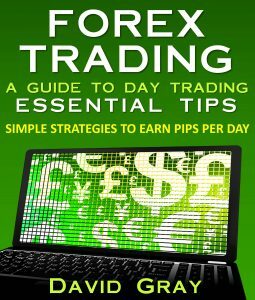 “Forex Trading: A Guide To Day Trading Essential Tips” is just the book to help with that. It not only has the definitions of what the various trading tools are but gives a concise explanation of how each system works. Of course everything has been done in steps to prevent the reader from becoming confused and the main point to bear in mind, which is highlighted throughout the book, is that the trends keep changing all the time so it essential to keep on learning if success is what is wanted. Author, David Gray, succeeds in explaining the aspects that he has highlighted in the book and the way they are outlined is easy for any individual to understand and execute.